← From passion to addiction ….it’s a short trip. A day in the life of IT Guy….. The year 1994 was pivotal for me. I had recently passed the dreaded “big five-oh”, now faced an empty nest, was changing careers and due to back problems was reduced to a power walker, thus ending 25 years as a dedicated runner. It was also the year that IT Guy was born. In spite of a career in industrial sales, I was totally computer illiterate, clambering around just to find the computer’s on button when I needed a sales report. How that information had already gotten into that aluminum abyss was beyond my imaginings. My amazement reached a crescendo when it somehow told another odd-looking machine, several rooms away, to print the report. If this was but a sample of what the approaching next millennium had in store, I knew I was in big trouble. While I was busy was going back to school to advance my new career, my brother-in-law, a technology guru of the first order and having updated his equipment to state of the art, let me have his old personal computer. After a lengthy struggle to get it all set up, I sat there in absolute awe just looking at this array of equipment that was to take my into the future. I began to contemplate some of the names and phrases with which I needed to quickly come to terms. Bytes? Was this machine going to lash out at me like a piranha if I did something wrong? DOS? Did this stand for Devoid of Sentience? I knew I certainly was. World Wide Web? And just where was this spider who was enticing this innocent fly into its web? Windows? Was this a portal to someone at another computer looking deep into the recesses of my soul? Dot Matrix? I thought she was just an imaginary character in the Star Wars Trilogy? Memory? Was my every action on this technical marvel going to be squirreled away in some data bank on an astral plane like the Akashic records? But I dove right in, in spite of my misgivings, and learned the ins and outs of computers to the point I was upgrading, downloading, uploading, de-fragmenting, scanning, replacing hard drives, changing batteries, adding memory chips, creating websites and just generally having a high old-time with my new toy. Now there is no computer technology I won’t at least try to tackle. Which brings me (finally) to the point of this post…..the cost of achieving this knowledge. Like it or not, I am now “IT Guy” at our domicile, responsible on a daily basis for ensuring all the information technology passes smoothly through the myriad of digital connections that dominate our lives. That includes two desktops for work, volunteer and social obligations, two laptops for staying on top of things while traveling, two tablets for each of us to read our varied books, two smartphones for quick and easy connections to family and friends, a fiber optic TV system that steams videos from our internet connection, and last, but not least, a home phone system that ties into our cell phones as well. My dear wife, whose talents abound in numbers too large to list here, does not do high-tech. Just not her thing. 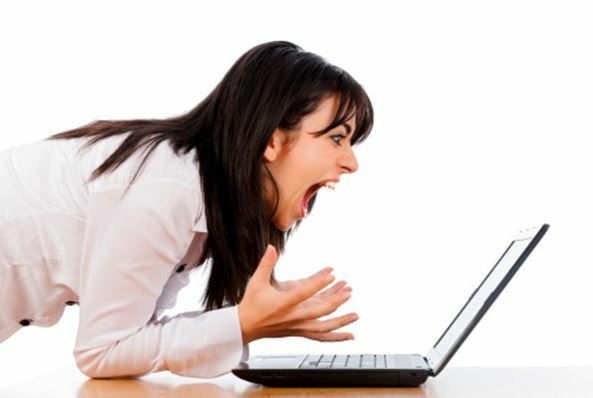 So when an update, change, glitch or outright crash of any of the aforementioned devices regularly occurs, I soon hear the plaintiff cry for IT Guy! I quickly shed my Clark Kent attire, don my cape and tights, summon up my super powers and fly to my adoring Lois Lane to save the day! Honey, could you come here for just a moment? There seems to be a small problem with the laptop. Take your time. Thanks, sweetie, you’re a dear. By the end of a day it tends to overwhelm and I wonder just how we got into a state of dependence on this unseen force that seems to feed on our very soul. It’s then that I walk out to the dock with a glass of wine, sit in my chair with the dogs at my feet and feed the turtle that has come to know when I am out taking repose. It’s my erstwhile Walden’s Pond. Later at night, relaxed and clear of mind, I gradually, but happily succumb to sweet Morpheus, knowing the next morning I will be innervated to once again assume the awesome duties of IT Guy. But be sure to stay tuned for my next post, when I describe how I use my super powers to fly around the house changing all the innumerable digital clocks when daylight savings time comes to an end! This entry was posted in Family and tagged computers, information technology. Bookmark the permalink. 30 Responses to A day in the life of IT Guy….. So now you have a pet turtle, too? 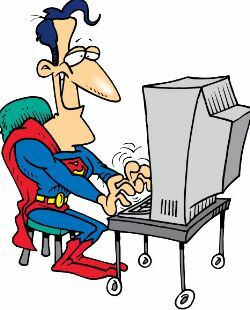 Lois Lane is blessed to have IT Guy on the premises. Life was much simpler with Print and Delete at hand. Hope you’re having a great summer, Al. Yes, Patti, it’s amazing. Whenever I go out to the dock, he shows up within 5 minutes for his handouts. None of the others will come in close, only him (or her). Having a good summer and hope you are as well. You’re doing much better than my father does with his computer. He knows just enough to be dangerous with it. On the other hand, my mother is like your wife. As soon as something gets difficult she just gives up. To be honest, along the way I have made a few costly mistakes, but those are the best learning moments. To illustrate about my wife and maybe your mother, yesterday she said she wasn’t getting any mail in the desktop computer in Outlook on one of her email addresses, but they showed up on her phone. Could I fix it? I looked and she had simply closed the folder for that address. I clicked the drop down arrow and there they were. Am I a genius or what? If that’s not genius, I don’t know what is. Today, my bills and medical stuuf are online as is my family tree, blog and other assorted items. I am using AUDIBLE with my e-books because my eyes are tired. I finished my grad degree in histoey two years ago, which mostly consisted of accessing libraries in Greece and discovering the joys of thumb screws. Oksy, okay, I know they are thumb drives. I scanned all my old slides and many photos, and have them on thumb drives. Imagine a closet full of slides from travels fitted into the palm of your hand! I make airline reservations online when I travel which isn’t often because all my money goes to Verizon these days. I can’t complain too much though because it comes back to me multiplied as an annuity..the price for all those techie years I spent with them as an employee. I’m giving Patty your phone number. Finally…I’ll get some rest. Good luck. Sorry, but the 800 number is out of order! I don’t wish to sound critical of IT Guy, but does it occur to you that you have more IT crap than Best Buy? It’s not you – it’s us. How the heck did we wind up with all of this computer stuff? And does IT Guy make house-calls? Because I’m IT Guy at my house and I can’t get any of my machines to talk to one another. I bought all this stuff because my mother didn’t love me. What’s your excuse? As for the communication problem….check to make sure all the plugs are properly connected (I learned that from a guy from India named Rakeesh). Couldn’t agree more, Cindy, except that I’m more of a “kick the can” guy. I was always IT Sheila in my house but then I accidentally bred three teenage boys and now I feel like Hardly-IT Granny. I took off-campus studies in 1993 and we communicated via things called bulletin boards and sent our assignments by floppy disc in the mail. Two decades later, you can do all that on a thing that fits in your pocket. Holy Sky, IT Guy!! Yes. I remember. I actually taught an online course in a community college and never met a single one of my students. If I had those clocks, my love wouldn’t need me around anymore. Actually, it’s me that goes around every night after she’s asleep and puts the “bugs” in those devices…but mums the word……OK. And since I’m confessing..it might not actually be a cape and tights….more like an old sweatshirt and baggy pajama bottoms. Do you make out of town house calls? I am thinking that you in tights and cape would just make my day!!!!! I sort of hate the way we are FORCED to learn the IT stuff (at least I am) if I want any androids to operate. My husband smugly tells me that he doesn’t have these problems since he’s gone all MAC, but even that utopia is coming to an end with MAC bugs and frequent updates. You’re a good man to keep everything running…no wonder you don’t do marathons anymore. Ah. So you live with a Mac snob. My condolences. My granddaughters are the same way. What would be the fun if things worked like they are supposed to. Frankly, I’ve had my share of “this is too hard to fix, I’ll just get a new one” moments. Then the stark reality of the checkbook overrides it all. 2. Yes, and she had an almost nonreturnable serve. P.S. We will be having that glass of wine together soon, I hope. What a fun read Al! I am not cut out to be an IT person, my brain is just not wired that way and the minute something goes wrong I call people like you or just head directly to the Mac store. It’s pathetic really how dependent I’ve become on machines I know so little about how they work. I guess a career in IT help is a pretty safe bet. Truthfully, if I had a nickel for every tech rep I’ve been on the phone with, I could actually buy a good computer. IT Guy and Keeper of the Clocks – you are one talented man! I (and on one occasion a tech named Raj in India) keep our computers running, but it is my spouse who is has the patience to be the keeper of the timepieces. Good for you Margie! I’ll tell Raj you said hello, we speak often.